LAS VEGAS (Nov. 9, 2015) – After more than 76 hours of competition in this event, the 2015 World Series of Poker (WSOP) Main Event Final Table is down to just three players who will vie for the most prestigious title in poker and a top prize of $7,683,346. Play resumes at 6:00pm Pacific Tuesday in Las Vegas from the Penn & Teller Theater at the Rio All-Suite Hotel & Casino and continues until a winner is determined. ESPN’s cameras will carry all of Tuesday’s final table action on a 30-minute delay at 9:30pm ET/6:30pm PT. The three remaining players are all guaranteed a multi-million dollar payday, with second place paying $4,470,896 and third place worth $3,398,298. Of course there can only be one world champion, who in addition to the $7.68 million in prize money, wins the their first WSOP gold bracelet and etches their name in the history books. The chip leader remains 24-year-old poker professional Joe McKeehen from North Wales, Pennsylvania. He has total tournament earnings of $3,514,982, including $883,494 in eight previous WSOP cashes. McKeehen has won two WSOP Circuit Rings, and his biggest cash before this final table was for $820,863 when he finished runner-up in the inaugural Monster Stack event at the WSOP in 2014 that featured another huge field – 7,862 players. Joe played 22 events during the 2015 WSOP, cashing in four, including the Main Event. His previous best finish in this event came in 2013 when he finished in 489th place. McKeehen entered the final table as the chip leader with nearly 33% of the chips in play, and it was he himself who eliminated the 11th, 10th, 9th, 8th and 7th place finishers in succession. He went into Monday’s play with six players holding 47% of the chips in play. Though he had a somewhat uneven day for him, he eliminated Max Steinberg on the final hand of the night to end with 67% of the chips in play – 128,825,000 and a commanding lead heading into the final day of play. Blumenfield, 61, from San Francisco, California (born in Chicago), looks to become the first 61-year-old winner of the WSOP Main Event since Noel Furlong in 1999. In fact, Blumenfield, at 61 years, 5 months and 2 days, would surpass Furlong’s age by two weeks, and make him the eldest Main Event winner since Johnny Moss was 67 in 1974. Blumenfield plays poker as a hobby and looks to become the first amateur winner of the event since Jerry Yang in 2007. Just prior to entering this year’s Main Event he was laid off his software job, and wasn’t even sure if he should spend the $10,000 to enter given his uncertain job status. He’s a UC Berkeley graduate and a former High School Debate Champion. Blumenfield has $44,395 in earnings via two previous cashes at the WSOP and has a total of one tournament victory and $130,468 in poker tournament winnings. This was the fifth-consecutive year Neil played the WSOP Main Event, and he had one prior cash when he finished in 285th in 2012. He sits in second place with 21% of the chips in play. Beckley is a 25-year-old poker professional from Marton, just outside Philadelphia. He has cashed four previous times at the WSOP – all coming this year – for $19,403 and his total lifetime live tournament winnings are $219,526. He played 14 events during the 2015 WSOP, finishing five of 14 in the money, with this being his first ever final table at the WSOP. He started this final table seventh in chips, but remained patient throughout, carefully picking his spots to put chips at risk, and managed to reach the final day of the event in third place, with 12% of the chips. When play resumes, players will return to Level 39 of the structure. Players will be forced to ante 150,000 each hand, with blinds at 500,000-1,000,000. So for every three hands, players will put into the pot 1.95 million chips each at minimum. Each player began this tournament with 30,000 in chips. Final Table play began Sunday afternoon at 5:00 pm with nine players. It concluded at 10:45 pm, following 72 hands of play and the elimination of three players. Patrick Chan, 26, of Brooklyn, New York., was the first person eliminated. Chan, who was last in chips when the second hand of play began, called McKeehen’s all-in bet with King-Queen. His hand didn’t improve, and he lost to McKeehen’s Ace High. He earned $1,001,020 for his ninth-place finish. Federico Butteroni, 25, of Rome, Italy, entered play as the shortest stack and managed to climb one spot and finish in eighth place. He took home $1,097,009 for his eighth-place finish. Pierre Neuville, a 72-year-old Knokke-Heist, Belgium resident finished in seventh place, earning $1,203,293. Neuville, the oldest player to reach the final table since Johnny Moss in 1985, entered the Final Table fourth in chips, but was unable to win hands despite holding very strong cards. His pocket queens improved to a straight in one hand, but he lost to a flush. Another strong hand was beaten by a full house and in his final hand, his Ace-Jack all-in bet seemed well positioned against Jack-Six of Hearts, but three straight hearts fell, giving his opponent the flush and eliminating the affable Neuville. Monday’s play started at 4:30 pm with six players starting in Level 37 with a 75,000 ante each hand, and blinds at 300,000-600,000 and just like Sunday’s play, we lost a player on the second hand of the day. Play lasted 3 hours and 45 minutes on Monday, and just under three hours of actual tournament time. Tom Cannuli, the youngest player at this final table at age 23, finished in 6th place and collected $1,426,283 for his efforts. The native of Cape May, New Jersey played just two hands on Monday. He was dealt the best starting hand in No-Limit Hold’em – Pocket Aces – and all the chips went in the middle pre-flop versus Max Steinberg who had pocket ten’s. A ten appeared on the flop, giving Steinberg three-of-a-kind, and Cannuli didn’t improve on the turn or river card. Cannuli, with an impressive array of notable poker pros in his corner, was supported by the most vocal and ardent rail of friends and family, and looks to have a bright future in this game. Ofer Zvi Stern, a 37-year-old from Herzilya, Israel finished in fifth place. Originally not planning to play the WSOP Main Event, Stern had a change of heart and flew in from Israel at the last moment to play for poker’s ultimate prize. That decision earned Stern $1,911,423. It was the only official gold bracelet event he played at the 2015 WSOP. It was the second-highest finish ever for an Israeli, behind Amir Lehavot in 2013, who finished third. Max Steinberg, a 27-year-old poker and Daily Fantasy Sports professional from Las Vegas, Nevada by way of Fairfield, Iowa finished in 4th place, collecting $2,615,361. He won his seat into the WSOP Main Event via a $27 entry into a Daily Fantasy Sports contest, won a Main Event seat as part of the prize package and now made 100,000 times his original investment by outlasting 6,416 others in this event. He entered the Final Table in fifth place, and was able to improve upon that by one position. He was the only WSOP gold bracelet winner left in the field, meaning our new champion will be a first-time WSOP champion. Steinberg now has more than $4.5 million in poker tournament winnings. Monday’s action was carried on a 30-minute delay on ESPN2. 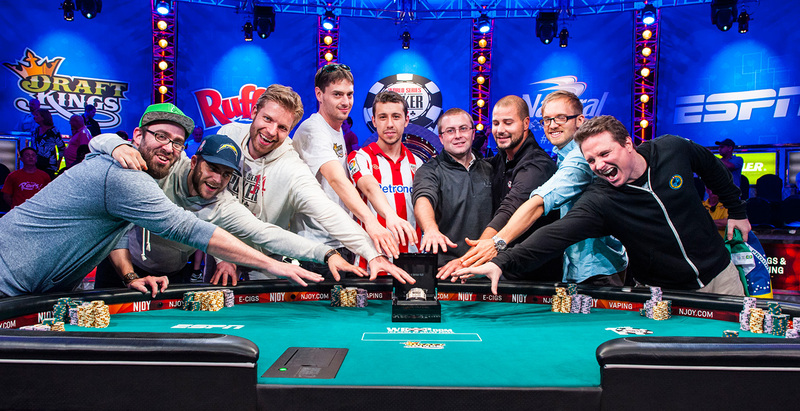 The 2015 WSOP Main Event began in July with a total of 6,420 entrants. 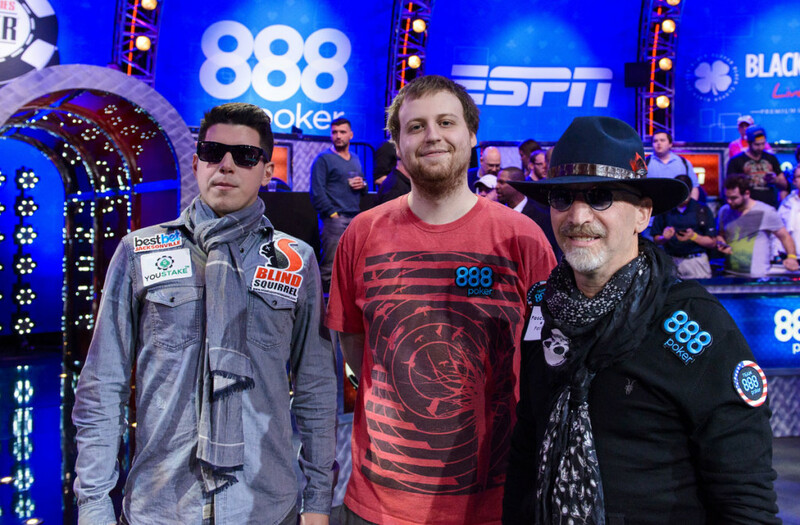 The event’s total prize pool was $60,355,857, with nearly $25 million going to the final nine players. A record total of 1,000 entrants cashed in the event. As has become tradition in recent years, Main Event play was suspended in July when the tournament reached its final nine players. It resumed with the “November Nine” taking to the felt Monday with 57 minutes and 36 seconds remaining in Level 35, with antes of 50,000 and blinds at 200,000 and 400,000. Play lasted nearly 5 hours and 45 minutes in real time, but consumed 4 hours, 10 minutes of tournament clock play on Sunday. Monday’s play lasted 3 hours and 45 minutes in duration.